east side bride: too much? I had a dream last night that one of my best ladies was getting married, and all I really cared about was what I was going to wear on my head. I am so not a headpiece person, people. But. 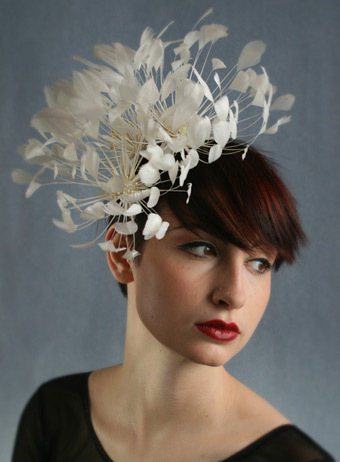 I'm kind of digging this feather flower spray by William Chambers Millinery. You think it's too much for a bridesmaid? if its tooo much depends on what the bride looks like, right? i really like this headpiece a lot. i would wear it on my own wedding for sure. I would do a DIY verson that was a bit toned down. but again it does depend on what the bride is wearing, as well as the other maids. Depends on the bride but one imagines if she is a friend she would be happy for you to wear something so delicious. I would. So if you're free in November, fancy a trial run?! i am in love with some headpieces. i wore one at my wedding... and i wish there were more occasions that called for a serious headpiece. It's fabulous! As a bride, I would wear it in a heartbeat. What does the bride think? Could you wear it again~it's a bit costly...but if the bride's game~go for it! Definitely not too much for a guest. But I am British, here it would be rude not to wear something wonderful on your head. Bridesmaids here are not so much about the head wear. And I know William, he worked with my best friend before he went full time as a milliner, his stuff's amazing. gorgeous, yes. but neither you nor i will be wearing that at my imaginary wedding. Very pretty, and way, way too much for a bridesmaid. Especially in that color. Totally agree with Laura. Sorry. It is absolutely an adorable headpiece and I would love to wear. Totally FOR headpieces!!! Bring it back!